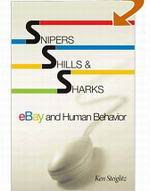 I recently read Ken Steiglitz's new book: Snipers, Shills and Sharks: eBay and Human Behavior. Auctions come in many forms: English, Dutch, Japanese and Reverse and variants of these. They have been used since at least 500 BC. But the real quantitative understanding of auction science has come from online auctions, and especially the explosion of eBay in the last dozen years. This has connected more buyers to more sellers than every before. Its also constructed a test bed for understanding the science, both quantitative and psychological, that drives auctions. Steiglitz, a computer science at Princeton, has written an excellent overview of auction science. The first 180 pages are completely non-mathematical. The appendix that follows contains the math details if necessary. There he does a good job of doing the proofs, which are usually of fairly idealized situations. He starts with the history of auctions, and then follows with a careful description of the different types that exist. Also a number of sometimes surprising revelations about the specific dynamics of eBay auctions, and how that influences buyers and sellers. He then describes examples of consumer behavior on eBay, tracking how people bid and the resulting outcomes. Most of his examples come from ancient coin categories. These outcomes are driven by participants sometimes weak understanding of the technology, their own internal economic models, and the psychology of the bidding process. Not all is rational here! Along the way you do learn some remarkable things about how eBay works. This book is not meant to be an introduction or guide to doing business on eBay, a quick search on Amazon shows dozens of such books, from the 'dummy' books to thick works on the best ways to make money there. This book, as its title suggests, is about how human behavior is represented in auctions. Along the way, Steiglitz suggests that a good way to study auction dynamics is using agent models. I think he is right ... this is not about the idealized 'Homo Economicus', or his student volunteers, but rather about rather irrational beings who display all kinds of interest, including emotions like 'spite' when they bid at an auction. He uses his classes to experiment with these kinds of auction behavior. That limits the breadth of what can be experimented with. I wish he would he extended his interest in agent models to show some examples to prompt more explorations in this area. Good book for those who want an introduction to the more technical aspects of auction science. At GA Tech last year we saw a demonstration of Facade: an interactive story. A clever idea where you interact with an AI. A sort of game link with an script. A scripted Second Life. The examples they show are short pieces of fiction, but you could script this for things like training. When there we saw an example done in a real 3D space. I didn't know they were still publishing magazines with the 'simulated page turning' display. Well here is one, the April issue of Blogger and Podcasting. Not sure I like it. To read the text you have to zoom in, that way you really can't scan the text, just the titles and pictures. Should new media ever simulate old media? You would think we are now beyond this approach. Simon Ellis, frequent speaker, well known supply chain Futurist at Unilever, is interviewed in Consumer Goods Technology. He talks about his view of supply chains and cautious views on RFID tagging. A colleague sends along a discussion article by Tom Davenport. In Harvard Business Online. As he points out, an excellent discussion follows.
" ... It's going to be very interesting to see what happens when the young bucks and buckettes of today's wired world hit the adult work force. Will they freely submit to such structured information environments as those provided by SAP and Oracle, content and knowledge management systems, and communication by email? Or will they overthrow the computational and communicational status quo with MySpace, MyBlog, and MyWiki? ..."
Claudia Kotchka holds Procter & Gamble's new secret to driving customer sales: infusing innovation into brands. When Claudia Kotchka wants to prove the impact of good design, she likes to show, not tell. This means the Procter & Gamble executive has found herself on occasion roaming the corridors of the consumer products giant's Cincinnati offices with tchotchkes on hand to show off to her colleagues. 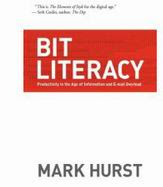 Just read Mark Hurst's Bit Literacy: Productivity in the Age of Information and E-Mail Overload.. Hurst is one of the founders of Creative Good, a user experience group which we have been members of for several years. Bit Literacy is an easy, short-flight read. Also has a web site, with sample chapters. This book contains lots of good ideas about making your use of computing more efficient. It seeks to increase your 'bit literacy', improving your computing experience, in useful ways. I do wonder about the practicality of some of his proposals, which exist in the realm of 'wouldn't it be nice if we all ...'. The first, and what will seem the most radical to many is his proposal that we should completely empty our email in boxes every day. Deleting, filing or placing each message in a todo list. He also describes some novel ways of using todo lists, using the package Gootodo, which he claims is the only 'complete' todo package. I would like to see my email inbox completely empty someday, he suggests it's an almost spiritual experience. I have not seen an empty in box for a very long time. He makes a good case for minimizing the use of e-mail attachments, says we should include all text in the body of an e-mail , and suggests that we should rarely use packages like Word, and stick with plain ASCII, where the text you see is exactly what is in the file. No fonts, no advanced formatting. I admire his view, but I think that train has left the station some time ago. His company has every candidate take a typing test, and believes that fast, touch typing is important. He goes a step further and suggests we should be using the more efficient DVORAK keyboard arrangement, rather than the near-universal QWERTY. Some packages allow you to switch arrangements with an easy parameter setting. Probably most relevant for those that do lots of typing, and I think you would get quite a bit of resistance for the re-training required. My own 'modified-peek' touch typing', last measured at about 25 wpm in high school, serves me reasonably well. I did like his ideas about file naming and maintenance, we could all do with a bit of better machine organization, making it easier to find things and minimize the number of keystrokes to get things to happen. He is not a fan of the mouse, and suggests we should do many things with 'bit levers', key strokes that implement words or phrases. He praises simplicity and order in messaging style, meriting an 'Elements of Style' comparison. I wish he would have done more in depth here. The last part of the book gets into what I would call literacy rather than advocacy, he does a good job describing some of the things all computer users should know about files, folders, extensions and the like. He overviews Windows and Macs, but prefers Macs, which are the standard for his company. He outlines how his company uses these methods. Hurst has thought much about the user experience of the personal computer and comes up with some thoughtful ideas. Not a revolutionary book by any means. I like Brian Schwartz's back cover comment that we have all learned our computing style piecemeal , this book starts to bring some of that together. How would new employees react to a 'Bit Literacy' class to establish a base of common usage? Recommended for those that want to think about what current computer experience is all about. Robert Scoble is the former Microsoft employee, who while he was there did a remarkable job of inside-out blogging. As a full-time MS employee he wrote a blog that often criticized MS, and as a result of his perceived objectivity, acquired a huge audience. Despite his sometimes critical view, even Bill Gates said he helped re-cast Microsoft's image. He also co-authored the book The Naked Conversation, a rabidly positive book about blogging, that received much press. Even P&G merits a mention there. He left MS some time ago and now works for Podtech.net. where he still blogs frequently. It seems he now has so many connections that it appears easy to generate lots of interesting posts. I had not been following him very closely of late, but in this weeks Businessweek, an article criticizing Microsoft's position in search delivery. Scoble says that their missteps in search " cripples their entire Internet strategy from the start ...". See his example here. Scoble is worth following, with a bit of a caution about his sheer net boosterism. read Carr's Roughtype blog for a balance of skepticism. Scoble does say that MS does research much better than Google, and provides a report on a tour. I met Jon Nordmark, founder, CEO and President of eBags this week at a Creative Good meeting which looks at excellent user experiences. Many of you may have heard the story of the eBags online store before. Very impressive home grown piece of work. Check them out, especially their consumer review section, now with over a million reviews. I have written about the Internet Archive, which has P&G content from as far back as 1996. When I speak about the Net I always mention that you have to realize that just because you have erased a page from its server location does not mean it's gone. That should make you more cautious about what you place on the Web. Now Google has come out with some new improved content removal tools. This does NOT mean that the trace of the content will be gone from the Web, only that it may be harder to find. The MIT Media lab announces the new human being, to be ushered in with this symposium. A bit of hubris here, MIT has some nerve assuming this responsibility ... Carr concurs: " ... We're definitely overdue for an upgrade - it seems like we've been stuck in Version 1.x for a few hundred thousand years, and that was after a beta that went on for freaking ever. Still, I think I'll probably hold off until 2.01 or 2.02. I don't want to be on the bleeding edge for this one ... ". Arrogance, perhaps? Had a intriguing conversation with Donald A. Norman, former Apple VP and known for his book Emotional Design: Why we love (or hate) everyday things. Here is his web site. He mentioned the formation of the Segal Design Institute at Northwestern where he is a professor. I plan to visit. He is in the process of writing a new book: The Design of Future Things and has posted some draft chapters. Sharp and inspirational guy. 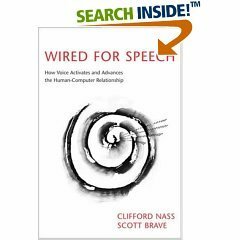 I just read Wired for Speech: How Voice Activates and Advances the Human-Computer Relationship , a book by Stanford prof Clifford Nass and Scott Brave. The Amazon link above lets you preview parts of the book. Nass was co-author with Byron Reeves of the book The Media Equation. In many ways Wired for Speech is a continuation and specialization of The Media Equation. Its a statement about how how our brain's recognition capabilities for speech are very specifically wired, and how a knowledge of that fundamental wiring is important to building speech-driven interfaces. Worth reading for people building these interfaces. It also makes the point, emphasized in The Media Equation, that humans interpret synthesized speech as though it was delivered in a human to human interaction, even when it is obvious it is synthesized, and they are repeatedly reminded of that fact. In other words, many of the same rules for human speech interaction apply for interaction between human and machine. This is startling stuff, and well worth understanding. Nass and Brave establish evidence for their conclusions with experiments with groups of volunteers, usually less than a hundred, who I am assuming are Stanford students. Hardly representative of real consumers, and I wonder some about statistical significance. A number of these experiments are described in the book. Nass was also involved in an experiment to deliver a sophisticated car navigation system for BMW. Car navigation assistance is a good example of this kind of voice interaction. Other excellent examples are systems that deliver consultation over the phone. Many of their conclusions rang true as I thought about when thinking about my own experiences with systems support at P&G. He spends much time on gender stereotyping in systems. Making the point that the wiring for detecting and responding to the gender of a voice occurs at a very young age. So do you use this finding to improve your voice driven interaction system, or do you attempt to re-engineer people from the top down? Heady stuff. Good book if you are designing or re-designing a voice based system. Or if you are interested in the linking of people and machines. I was invited to be part of IBM's Alamden Institute Navigating Complexity workshop. I have connected with IBM a number of times at Almaden over the years, and the spectacular site in the hills above San Jose really does expand your mind. It's much more interesting than the Almaden site in Second Life! I do applaud IBM and the leader of the session, Myron Flickner, for pulling this meeting together. I was surprised at the number of people there that I had met in the past. Stuart Kauffman, of Santa Fe Institute and Bios Group, Doug Engelbart, inventor of the mouse. William Rouse - organizational modeling expert. Brian Arthur - synthetic economist. Also made lots of new conenctions. Surprising too that even the definitions of complex systems are still in debate. There is also the subspecialty: Complex Adaptive Systems, which assumes the models are adapting. Not unusual, though the time scales can be very different. William Rouse presented a paper developed for presentation to the NSF which tries to button down definitions and research directions. The presentations could be divided roughly into two groups. One about the architecture and function of the brain, and the other about business-related topics. Certainly the brain is a complex system. Complex systems also exist in business. Supply chains, organizations, software, communications and innovation flows. The work on brain systems is intellectually very interesting and I found it fascinating, but it really should be handled in a separate meeting. I could not have brought my business clients into that meeting. Separately, with the right kind of specialists, they could be more useful. Almost everyone in the group was either in academia and research. The exceptions were me and Ronald Johnson from Boeing. I challenged the group that we should look much more closely about how we can translate complexity systems to make them more useful for business applications. This should include improved architectures and methodologies that include experimentation frameworks. One question that was asked was what kind of problems have truly been solved using this technology. There are some examples, but far fewer that there should be. Several examples where shown, notably some work at CMU on how to analyze organizations, that looks very promising. I will provide more details in a forthcoming post. What ever model your build needs to be trustable. Why else would management use it to support decisions? Complexity models may not be verifyable in the normal sense, but for their results to be trusted, there needs to be a method to overlay an experimental design that can gain that trust.
" ... Simply put, DayJet will make it easy for you to travel point-to-point between those hard-to-reach regional markets by providing a personalized air transportation system that responds to your needs. Upon receipt of the necessary government operating authority, DayJet's "Per-Seat, On-Demand" jet service will give you the freedom to travel where you want to go, when you want to go, and bring you back again on your schedule, not ours. You decide. All at a price comparable to that of an overnight stay (including airfare, hotel, and per diem) ... "
In a conversation with Jim, he told me that this is the first case where a venture has been effectively pre-modeled, to maximize the potential for profitability. I previously reviewed Scott E Page's book on problem-solving diversity: The Difference: How the Power of Diversity Creates Better Groups, Firms, Schools and Societies. A rare analytic look at the topic. Tim Sullivan correspondent at Princeton University Press sends me some new mentions of the book, thought-provoking pieces, also here is the prologue to the book, a good introduction.
" ... First is a lecture Scott did at Ohio State; it's (unfortunately) a Real Player file. It runs about 45 minutes total and Scott starts at 6:10. The second is a podcast from the Invisible Hand, where Scott fields some interesting questions from Chris Gondek. Finally, Michael Mauboussin, the strategy wizard at Legg Mason, writes about how Scott's book gets into the mechanism of the "wisdom of crowds" and "blink" phenomena ... "
Bill MacReady, who formerly worked with us on advanced supply chain models is now with D-Wave. They have demonstrated what claims to be a commecial quantum computer. Bill is formulating some very hard math problems to put the system to test. 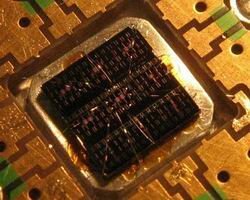 This could solve some very hard design, simulation and scheduling problems that are as yet uncrackable. Now the critics are out, including an article in Technology Review. This weekend there was an article in the NYTimes, and some insider criticism about the demo. This has the potential of being the biggest advance in computing in many years, but some claims remain to be proven. You can create your own personalized Google Maps, annotated and customized with images, video and web links. Say for documentation of a study of retail conditions. A geographic map is an ideal interface. We have experimented with Geographical Information System (GIS) interfaces to systems like optimization models. This had historically required quite a bit of programming effort. Mash-ups on top of existing platforms like Google Maps and Earth provide new flexibility for using this kind of interface. Long-time correspondent BJ Fogg of Stanford sends along an alert on his upcoming conference, quite interesting. See also his Captology site. Can a web site persuade you to be politically active? Can a mobile phone motivate you to exercise? Does instant feedback on gasoline use change how people drive? Do online rating systems inspire people to behave better online? PERSUASIVE 07 will focus on how digital technology can motivate and influence people. This event will bring together researchers, designers, and developers interested in computers designed to change human attitudes and behaviors in positive ways. Key themes of PERSUASIVE 07 include health, education, sustainability, productivity, social relationships, trust, credibility, ethics and more. Technologies of interest include web sites, mobile phones, video games, and electronic devices, among others ..."
Ray Ozzie, Chief Software Architect at Microsoft, in an insightful interview with Knowledge@Wharton. Good article on the current state of RFID and work ongoing at Kimberley-Clark, Best Buy, DHL and Wal-Mart. Some details on KC's work with display tracking, an example of RFID tagging focused to clear business problems.
" ... One Wal-Mart supplier, consumer goods company Kimberly-Clark, is about to expand to more products a pilot that used RFID to monitor promotions of its Depend adult diapers. The company created fully stocked promotional displays of Depend and put RFID tags on the displays before shipping them to Wal-Mart and Target, another RFID pioneer. Using software OATSystems developed with Kimberly-Clark's input--and which the vendor began selling last week--the consumer goods company could see on a color-coded dashboard how many stores received the product in the stockroom and how many put it on the store floor. That setup helps Kimberly-Clark know if the displays are on the floor at the same time its ads run. "We back up promotion displays with TV advertising, so you spend a lot of money trying to get consumer awareness of them," says Mike O'Shea, director of corporate AutoID/RFID strategies. The feedback wasn't good: Kimberly-Clark learned that just 56% of stores executed the promotion on time, and those that were late reported lower sales. It used the information to work with the retailers and has since been able to increase on-time execution of Depend store promotions to 75%. It's these types of focused applications that will work for RFID, O'Shea says. Although no one was naming names, last week's RFID World conference was rife with talk of Wal-Mart suppliers that have spent considerable money on RFID, are collecting loads of data, yet haven't figured out what to do with it. "They got caught up in the hype of the technology and lost focus," says O'Shea. "You will get those wins, and we've proved that." ...."
Good overview article in CNet on IBM's Many Eyes project. Shared visualization. You can upload your own data, but the results are public.
" ... Researchers in IBM's Visual Communication Lab plan to add more social-networking features to the Many Eyes Web site because they believe communities will be formed around the data-sharing and visualization tool. Still in public alpha, Many Eyes allows users to upload data sets from an Excel file or other common delineated files, click a few times to create a visual, and make it available to the public. Viewers can manipulate the 15 different types of data charts or visualizations to search and parse for alternative views and specific data subsets. By the summer, the IBM team plans to allow users to pull bigger versions of visualizations and tools into blogs, incorporate live updates into Web sites, add more browsing options, and create categorized forums so that people with similar interests can have a place to discuss the data. Many Eyes has grown from 20 data sets to more than 2,000, and has been used by Christian bloggers to analyze the Bible, and book enthusiasts have used it to upload data from Project Gutenberg, says Matt McKeon, a developer for the project. He believes sports statisticians will take to Many Eyes once more become aware of it, and hopes other researchers will put the Web site to good use ... "
An update on Justin TV, details. The more I see of this, the more it looks like a piece of performance art than a marketing experiment. They have an open and visible and often vicious comment stream that has to be scaring away any business sponsors! Suggest they at least make it optional when viewing the live video feed site. Last year I attended a meeting put on by Hilton about the future of the business traveler. One of the biggest gripes by frequent travelers was the connectivity issue. I have had many, many problems with connectivity. Early on it might have meant crawling under the bed to splice a telephone line. Now its mostly getting a wireless connection to work with our VPN. It is improving, but the technology is there to make it much better. Now I see that Mariott plans to introduce room plug-in panels that will adapt to many kinds of digital devices. More from Mariott. See the panel above, which does not seem particularly revolutionary, but it is certainly in the right direction. Videos and demos at the Mariott site. Not devoted to just getting work done! I am a physicist by (long ago) training, so I try to stay up to date in astronomy and physics. Also very interested in the history of these sciences. Just finished David Lindley's new book : Uncertainty. Lindley is a Phd Astrophysicist. A very non-technical look at the history of the subject and all the players involved. Heisenberg, in particular, has seen much publicity in the last few years. To what degree did he sabotage the Nazi bomb effort, or did he believe that a bomb would require tons of fissile material and just stumble in the effort? The debate, which I read about in the NYRB, even produced a play: Copenhagen, about the conversations between Bohr and Heisenberg, which I saw in NY a few years ago. A friend quipped that before seeing Copenhagen a degree in physics or the history of the subject was useful. Lindley's book is good. It's completely non-technical, nary an equation to be seen. It still is dense for those that have not taken a college level physics course or studied the history of science. Or are at least enthusiastic about the subject. He makes a too much of Heisenberg's membership in wandervogel (hiking) societies in Germany. He makes too little of the broad misinterpretation of Heisenberg's uncertainty as the fact that an observation can influence its subject, for example in the interpretation of literature. I like his link to Adam's Education of Henry Adams, though physicists may cringe. His final conclusion regarding Heisenberg's wartime complicity is that H never denied he misled his superiors, nor did he say he did. He does provide a good overview of the history of atomic theories, from planetary model to a strange view of uncertainty. Influenced even by the translation of the word Heisenberg used from German to English. Ending in a struggle for the soul of science that is still under way. Worthwhile read.